"Tiberias is popular for various reasons, but in particular for it's stunning views of the infamous Sea of Galilee, where Jesus performed one of his many miracles..."
An enchanting holy city that is important to both Jews and Christians, it is the burial site of some of Judaism’s most important scholars and sages, while also offering access to the Sea of Galilee, where Jesus performed many of his miracles. 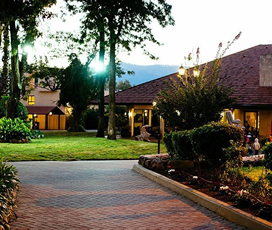 This combines with a more modern tourist culture, where visitors can relax on the beach, bathe in bubbling hot springs and enjoy a bustling nightlife to make for a fascinating destination. It is also home to plenty of places that outdoor enthusiasts to enjoy, such as Mount Arbel, Israel’s tallest peak that provides spectacular views over the surrounding area. A very popular form of accommodation for tourists in Galilee are Kibbutz, where there is a focus on communal living and nature preservation. 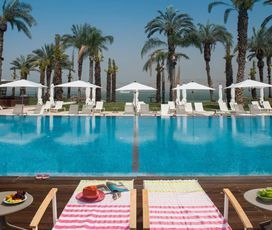 Tiberias is a small city located west of the Sea of Galilee, and is popular with tourists and offers a good selection luxury hotels. If you want sun, combining a beach holiday with culture, then this may just be the place for you. 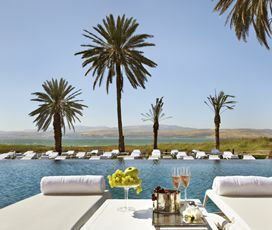 A historic city perched on the western edge of the Sea of Galilee, it holds a plethora of important religious sites for both Christians and Jews, along with a bustling café culture that all visitors are bound to enjoy. There are a number of national parks and mountains in the area, including Mount Arbel, Israel’s tallest peak. The city is fairly small, with a population of around 40,000, making it perfect for a relaxed holiday close to the sea. 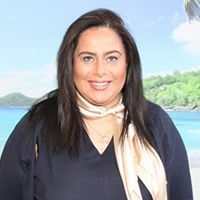 With its hot summers and mild winters, the best time to visit is between May and early October, when the temperatures average in the mid to high twenties. The hottest month of the year is August, which boasts an average temperature of 29 degrees and average sea temperatures of 28 degrees. The coldest month of the year is January, when temperatures sit at 14 degrees, which is warm enough to make it an all-year-round holiday destination. The area around the Sea of Galilee has been inhabited since the Bronze Age, although Tiberias was only founded in 18 AD, during the life of Christ under the son of King Herod. It became much larger after the destruction of Jerusalem by the Romans, when numerous Jewish refugees fled there. It then developed into a multicultural city under the Byzantine Empire, when Jews, Christians and Muslims lived together in relative harmony. It was also the site of many battles of the Crusades, with an especially famous victory by Saladin won on the slopes of Mount Abel. It was the scene of much violence during the 1930s as Arabs and Jews strived to gain control of the area, being captured by the Israeli army in 1948 and being a part of Israel ever since. There is a plethora of great activities for families to enjoy in Tiberias ensuring fun for people of all ages during their family holiday. 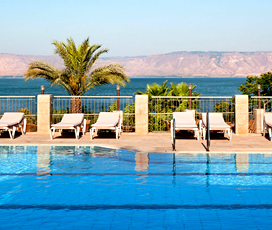 The Sea of Galilee is a wonderful and historic place, where children can swim and discover all the fascinating history of the area. Numerous companies provide boat trips around the entire sea, allowing you to explore this fascinating natural wonder. 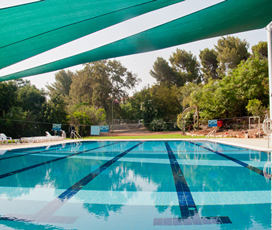 The Aqua Kef aqua park is ideal for families who want to have some aquatic fun. While the opportunity for families to hang around on the beach should also not be missed. The historic synagogue of Hamat Tiberias is a must visit for anyone in the area, with its stunning mosaic floor worth a visit in and of itself. While more active holidaymakers may wish to hike to the top of Mount Arbel, whose summit will reward you with stunning views of the Golan Heights and Sea of Galilee. Anyone who is interested in history or religion should take a guided tour of the Sea of Galilee, which is the location of many of Jesus’ miracles. While the Church of the Primacy of St. Peter is the location of the famous ‘feeding of the 5000’ and is a fascinating place that all visitors are sure to appreciate. 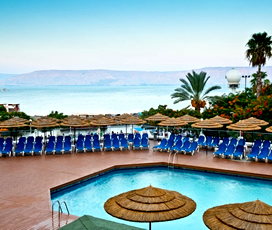 Tiberias has a vibrant nightlife, which is centred around the waterfront and the Old City. During the summer party enthusiasts can take a night-time cruise on the sea, which leave from Kinneret Beach and are the perfect way to have a different kind of maritime experience. This coupled with the various clubs dotted around the harbour and wharf area ensure that there is plenty of evening entertainment to be had. There are also a series of excellent beachside restaurants offering the chance to have a romantic meal with your significant other and enjoy a spectacular vista over the sea and surrounding area. The area of Tiberias is famed for the quality of its boutique shopping, which generally revolves around fashion and can be found on the winding streets of the town itself. These shops offer products from both local and international designers and are perfect for those who love to find something unique. The town also hosts a market, where visitors can find local food produce and has a smattering of larger malls too.